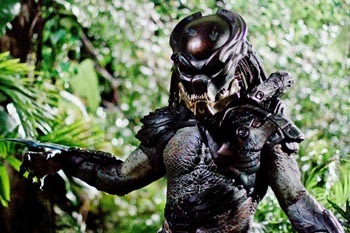 At last – the sequel to PREDATOR we’ve been waiting for! With the internet ablaze with derogation over the casting of Adrien Brody in the lead role (purely because action fans cannot comprehend life after Arnold), and the B-movie schlock of the ALIEN VS. PREDATOR movies sullying DVD rental racks around the planet, it would seem PREDATORS had little chance of being taken seriously by moviegoers or the men who make the moving pictures. But Robert Rodriguez (producer) and Nimród Antal (director) have bowed their heads in fealty to the legendary 1987 PREDATOR film, shinked out their arm-talons and ripped forth a roaring rebirth for the franchise. PREDATORS starts in free fall – literally – as eight nameless characters drop from the sky into a mysterious jungle. They’re all the best “predators” in their killing fields. They discover they’re on another planet – a grand vista of three gigantic moons in the sky and a sun that “hasn’t moved since we got here” tipping them off. And they’re being hunted by something. The planet is a game preserve and they’ve been dropped here for sport. The over-arching theme, which is sometimes used as the embarrassing tagline: “When the predators become the prey.” Oh, I feel dirty. Adrien Brody, an American Special Ops merc, is the tacit leader and therefore has to put on the raspiest voice. There is the Russian Special Forces soldier (Oleg Taktarov, last seen with De Niro in RIGHTEOUS KILL and 15 MINUTES), a Mexican drug enforcer (Danny Trejo, last seen in any Robert Rodriguez film), a Yakuza (Louis Ozawa Changchien), a Sierra Leone soldier (Mahershalalhashbaz Ali, last seen buying another vowel), an Israeli sniper (Alice Braga), a death row inmate (Walton Goggins, last seen as Sam Rockwell in THE GREEN MILE) and a disgraced bean stem of a doctor (Topher Grace, last seen apologizing for being an actor). Onward to plot that makes sense if you discount everything else. Luckily, Brody has read the script and rasps the exposition above. But you don’t need the script if you’ve got someone who saw PREDATOR; Alice Braga recounts the story of the Special Forces guy (that would be Arnold, fanboys) who killed one of the hunters and described its proclivities. Can’t help feeling the cast is a leetle too international for the sake of worldwide box office – or maybe they’re just auditioning for a crowd of passengers in another SPEED movie. First act is tight, effective screenwriting; characters introduced smartly, situation assimilated; inexplicable jungle mystery, thriller, action, even some horror. All the classic story elements that made PREDATOR so good. PREDATORS reminds us of ALIEN 3: back to basics to bring the solemnity under control again. Suddenly – Laurence Fishburne. A surprise cameo, an eccentric old hermit, well-built, brain-fried, and whispering in that Morpheus velvet about surviving for ten seasons. He reveals the Predator hunting party travels in threes. They’re played by Carey Jones, Brian Steele and Derek Mears, and they’ve been given names by the filmmakers that we discover only by reading the credits: the captive, strung-up Predator is Classic Predator; the leader of the three hunters is Berserker, larger and scarier than Tracker and Falconer. The armor and headgear of these new Predators is akin to the development of Batman’s suits; more jagged and streamlined than previous versions. Makeup by Greg Nicotera and Howard Berger goes above and beyond the call of B-Movie duty. Like the rest of the production, they’re taking it very seriously indeed. There are numerous homages to PREDATOR, creatively intertwined into this tale, and Little Richard’s Long Tall Sally (which is blaring in the chopper on the way to the drop zone in PREDATOR) plays us out over the closing credits. There are the unavoidable cliché moments: Walton exalts, “We killed it! We killed it!” and is suddenly shot in the back by “it.” There are the interesting twists of character, and even a grand moral dilemma: when Topher is injured, rather than carrying him as dead weight, Brody decides, “We leave him as a booby trap.” When Alice protests, he elucidates on how the Predators maimed Topher to slow down the fleeing humans, knowing they would carry him, “They’re banking on us being human.” I love the smell of sociopath in the morning. It seems Predators are taken down not by their superior technology or weaponry, which, if utilized judiciously, can take down any prey in the galaxy – they are done in by their own hubris! They are arrogant beyond caution. Brody (covered in mud like Arnold) goes mano a mano against the last Berserker; when the Pred could easily shoot Brody as he lies squirming on the ground, he opts to grab Brody by the neck and throw him. Even picking Brody up by the neck could warrant an efficient killing stroke if the Pred just shinks his arm-talons up through Brody’s throat. Nope. They take toying with their prey to new levels of carelessness. Maybe it is this inherent ego, conceit and pride that makes them hunters in the first place (those characteristics sure work for Man); maybe this same presumption of their superiority impels them to waste resources bringing animals from throughout the solar system to dump on this planet as prey; all we know is: “Pride goeth before destruction, a haughty spirit before a fall.” (Proverbs 16:18). Another reason for Predators to read the bible – they’d kill us more efficiently. They should also stop watching 1960s Batman episodes. It’s almost as if the words of the Little Richard song reflect the taunting hubris of the Predators, “We’re gonna have some fun tonight – whooo!/ We’re gonna have some fun tonight – whooo!/ Have some fun, havin’ me some fun tonight!”– Oops! Blown up by humans again! aka: PREDATOR 3, PREDATOR III. Writers: Alex Litvak, Michael Finch, Jim Thomas, John Thomas. Starring: Adrien Brody, Topher Grace, Alice Braga, Walton Goggins, Oleg Taktarov, Laurence Fishburne, Danny Trejo, Louis Ozawa Changchien, Mahershalalhashbaz Ali, Carey Jones, Brian Steele, Derek Mears.